What is your favourite Georgette Heyer novel and why? Then send your answer to maryhoffman@maryhoffman.co.uk so that I can contact you if you have won. I write a great deal about life in the middle of the last century and about people who made history in a variety of different ways. 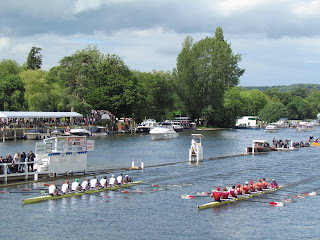 Today I want to tell the story of a group of young men who made history nine years ago and who have joined the pantheon of greats in the small but exclusive field of Henley Royal Regatta rowing winners. Sunday 8 July 2007 and the market town of Henley-on-Thames is enjoying a warm afternoon. 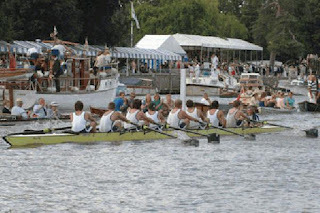 On the Buckinghamshire bank of the river the scene is one of colour, pageantry and tradition: blue-and-white striped boat tents marshalled neatly between the pink-and-cream Leander Club hard up against Henley Bridge, and the white marquees housing the grandstands and Stewards’ Enclosure on the downstream side. It is finals day of the regatta, the day when lives are changed for ever by the outcome of an individual race. At 3:50pm two crews of nine young men line up at the start, next to the lozenge-shaped island in the middle of the river crowned by an elegant temple designed by the eighteenth-century English architect, James Wyatt. The umpire is standing in a handsome launch, arms raised, holding a red flag vertically above his head waiting for the two coxes to indicate that their crews are all set. Are you ready? He sweeps the flag down sharply. Go! Sixteen blades dip into the water. They are off. There is expectation and excitement all along the river bank – not least in the Stewards’ Enclosure where nervous parents fidget, check their watches, exchange anxious glances and wonder why the commentator has not mentioned the race yet. But patience. Then the deadpan announcement over the loudspeaker: The final of the Princess Elizabeth Challenge Cup is in progress between Brentwood College School on the Berkshire station and Shrewsbury School on the Bucks station. Brentwood College School are the Canadian National School Champions. No mention of Shrewsbury’s pedigree. Upwards of 100,000 people attend Henley Royal Regatta each July. It is an event caught in a bubble of history with echoes of a bygone era everywhere: fine hats, striped blazers, picnics in the car park come rain or shine, decorated launches bobbing on the white booms that line the course, Pimms jugs clinking with ice, champagne and oysters, a brass band playing military tunes, and all the while a titanic battle is being fought on the water. 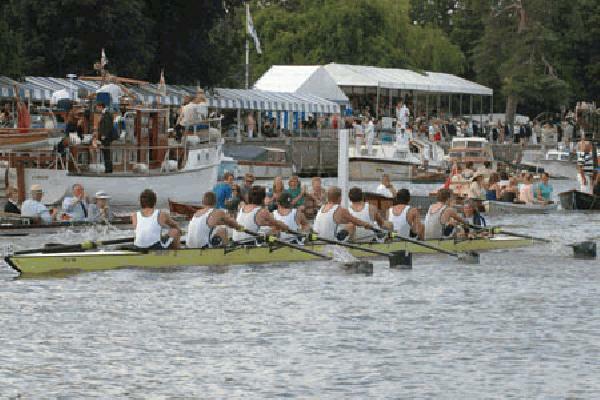 Brentwood had dispatched the favourites, Eton, in the semi-finals the day before and Shrewsbury had beaten Radley in a slower time. At the end of the island, both crews rating 42, Brentwood College School lead Shrewsbury School by half a length. Forty strokes in from the start and the Canadians already have a half-length lead. Six minutes to go. The grandstand is full of Shrewsbury supporters. There is barely a free seat, the atmosphere tense. Elsewhere people are milling around the bars and chatting. Henley is, after all, a great social event. It marks the end of the summer season, after Ascot, and coincides with finals’ day at Wimbledon. At The Barrier, Brentwood College School maintained their lead of half a length over Shrewsbury School. Time to The Barrier, 1 minute 58 seconds. A buzz. One second faster than yesterday. The Barrier is one of two points where intermediate times are taken, times that later will be scrutinised, compared, delighted at or despaired over. The spectators downstream can see the action first. Crowding along the river bank they get close-up views of the two crews battling it out in the early stages of the race. The next timing point is Fawley. Now there is a change: At Fawley, Brentwood College School’s lead over Shrewsbury School has been reduced to a quarter of a length. 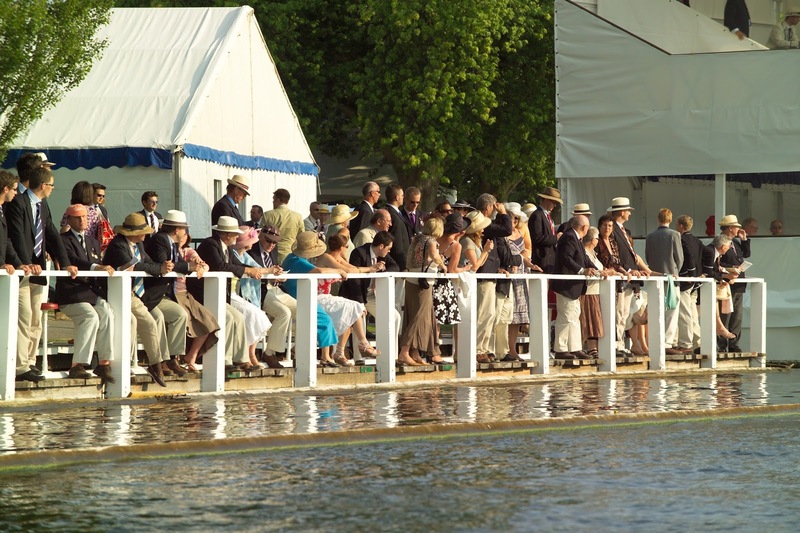 The grandstand is in spasm, spectators begin to move towards the river bank sensing a spectacle. Downstream the shouting has increased and the excitement is palpable. Can the home crew crack the Canadians? At The Three-Quarter Mile Signal Brentwood School led Shrewsbury School by 2 feet. The grandstand is on its feet, a roar is moving up the bank like a giant wave. Half the race gone. At the Mile Signal, Shrewsbury School had taken the lead. Wild elation but fear too. The Canadians were not about to give up and Shrewsbury supporters knew that. ‘We could see them now and it looked hell’, wrote housemaster Martin Humphreys to crew member Tom Hanmer’s parents. ‘Shrewsbury on the far side pounding away, looking a bit scrappy and tired, to be honest. Brentwood on the near side and neat and long. When they came past us Shrewsbury had a quarter of a length lead, but I could see the Canadians were eating into it with every stroke. This was grim.’ The two boats cross the line neck and neck. Then there is silence. The commentary ceases and the Finish Judge has to make his call. The wait seems interminable, time stands still. 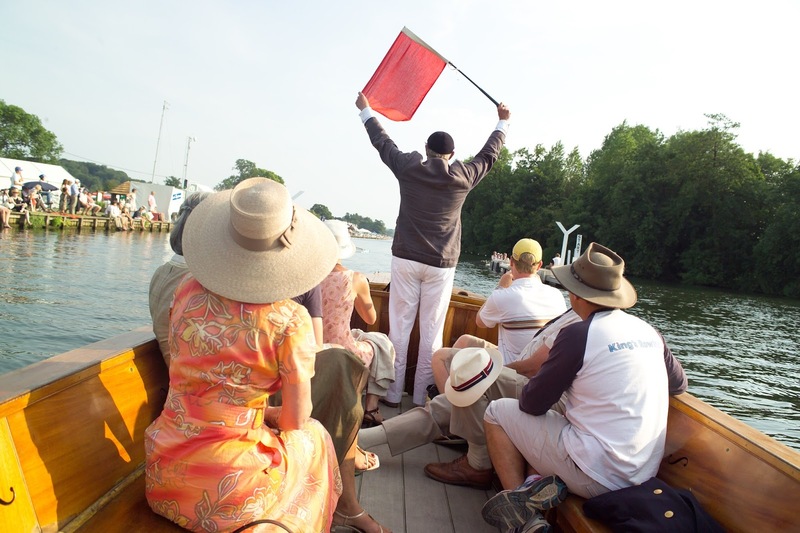 Then: The result of the Final of the Princess Elizabeth Challenge Cup was that Shr …. No need for the rest: the name of the winning crew is always announced first. The grandstand explodes in ecstasy … the verdict, one foot. More cheering. The narrowest, the shortest, the tiniest of winning margins imaginable, less than a sixtieth of the length of the boat. For Brentwood College School a bitter blow. To be a member of a losing crew, however epic the race, there are no prizes. For the boys of the winning crew and their parents, unsurpassed joy, a matter of lifetime pride and for one man in particular this is a sweet victory. Eighty-three-year-old Michael Lapage watched his grandson, Patrick, help to win this great battle. Nearly seventy years earlier, on the same stretch of river, Michael had won silver for Great Britain in the 1948 Olympic Games. The legacy of a Henley win is a long one. It unites generations and brings tears to the eyes of the strongest of men. There has been much in the news this year about the 1916 naval Battle of Jutland and the role of Admiral Sir John Jellicoe. But has anybody mentioned another Jellicoe who was also employed by the British Royal Navy and active during the First World War? I doubt it, because the other Jellicoe was a sea-lion. 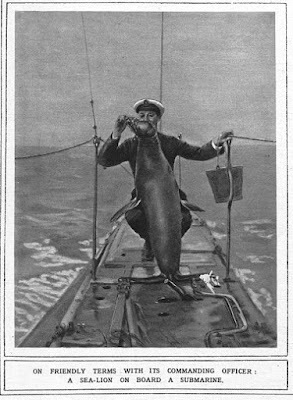 He belonged to Captain Joseph Woodward from Ramsgate, Kent, whose family had one of the first touring sea-lion shows. The sea-lions were trained to juggle, balance balls on their noses and dive for chocolates. During the First World War, German U-boats were sinking tons of British merchant shipping. Captain Woodward was sure that Jellicoe and his under-water colleagues could help. Sea-lions have excellent underwater vision and hearing; can swim 25 mph (40 kph); dive repeatedly to a depth of 1,000 feet - 300 metres; and are as intelligent as dogs. The British ‘Board of Invention and Research’ agreed it was worth a try. Trials were undertaken first in an outdoor swimming pool, and then in Lake Bala in Wales. 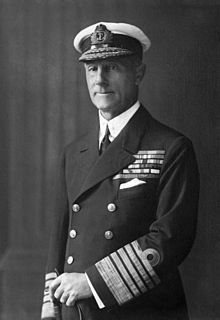 Captain Woodward’s idea was that Jellicoe would track the sound of a U-boat engine -however deep it was in the ocean- and swim towards it with a float attached to a cord. The Navy would follow the floats, and know that a U-boat was underneath. The first trick was to encourage them to track U-boats, and not fish. All went well, until they were put to work in the actual sea off Southampton. Despite wearing muzzles, they ignored the Royal Navy submarine, and went straight for the fish. The sea-lions returned home but after yet more training, in 1917 the experiment was abandoned. However, it was agreed that important developments in 'hydrophone science' had been made. Jellicoe and his comrades were demobilized and returned to civilian life. But Jellicoe’s career was not over. Hailed as "the actual Admiralty U-boat hunting sea-lion", he continued to perform in theatres such as The Hippodrome in London. I first learned about Jellicoe when I found a yellowing press-cutting among my late uncle’s papers. The Birmingham Mail revealed that in January 1921 Jellicoe was performing in the Victory Circus at Bingley Hall, Birmingham. This was not far from where my grandfather Rosslyn Bruce (great nephew of the afore-blogged Felicia Skene) was a vicar. He wanted to raise money for the poor children of Birmingham, and he loved animals. He persuaded Captain Woodward that Jellicoe would bring great publicity to the Fund – and, no doubt, the circus too. Birmingham Mail January 14, 1921. 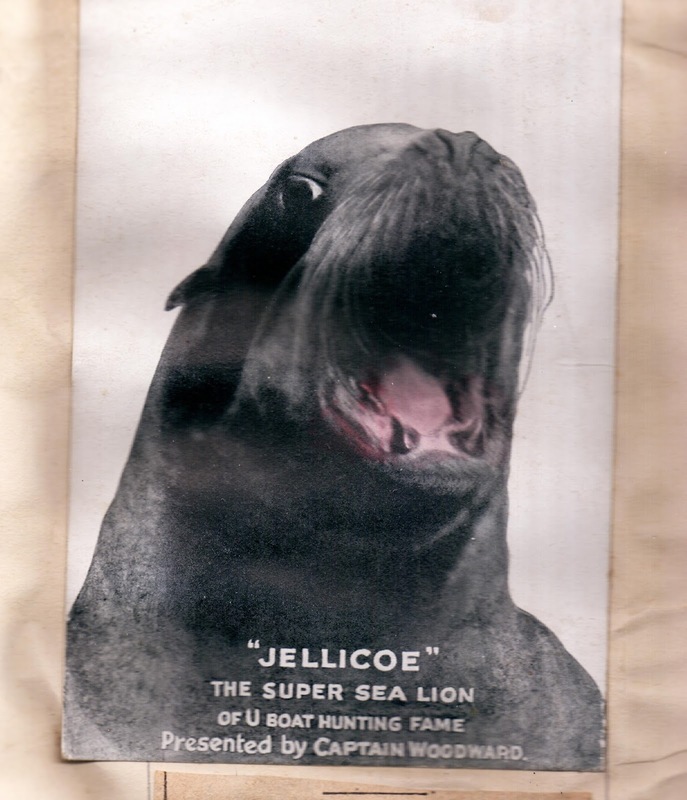 "Extra-ordinary scenes were witnessed in Birmingham today," reported the Birmingham Mail, "when the sea-lion ‘Jellicoe’ drove to the Mail offices on his motor cycle combination." The convoy included two motor cars "decorated with flags and red, white and blue ribbons...Jellicoe was apparently oblivious to the flattering reception received from the huge concourse" – estimated to be the largest crowd ever seen in Corporation Street. "He sounded his horn repeatedly when anyone threatened to get in the way. Jellicoe’s instinct, however, is so intense that he requires little help to avoid obstacles. Throughout the journey he never seemed like losing control of his machine." No mention was made of Mrs Woodward, hidden beneath his flippers. "Arriving at the office of the Birmingham Mail, Jellicoe dismounted and proceeded up the steps to the front door. Introductions having been effected, Jellicoe indicated a desire to proceed to the editorial department and was directed upstairs." Around the neck of "this amphibious messenger" was a cheque for £251 8s 8d, raised at a charity concert for the Christmas Children’s Fund. 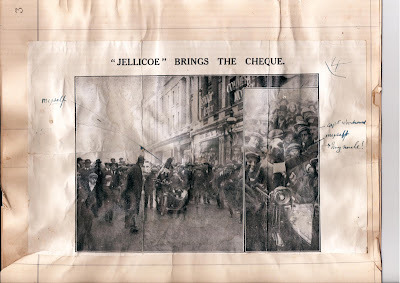 "Jellicoe shook hands, saluted and descending the stairs, made his way to the motor cycle which he at once mounted and drove away, sounding his horn furiously to the great delight of the crowd." In the faded newspaper photo, my uncle Merlin, then aged 11, can be seen sitting in the side car beside Jellicoe as it travelled down New Street. A year later Merlin Bruce went to Dartmouth Royal Naval College from where he became commander of an early aircraft carrier and was later awarded an OBE for defusing bombs. Since the 1960s, the US Navy has been training California sea-lions to locate sea-mines and lost divers, and even attach leg-cuffs to suspected saboteurs who can then be hauled to the surface. Sea-lions can also film live videos of the ocean floor with cameras attached to specially-designed harnesses. So far, the US Navy has not admitted to training them to drive motorcycles, with or without sidecars. It is that time of year again. Late September. The season of ‘mellow fruitfulness’. There are no mists here at this time of year in the south of France but there is a great deal of mature sunlight oozing its warm beams for long hour after long hour. 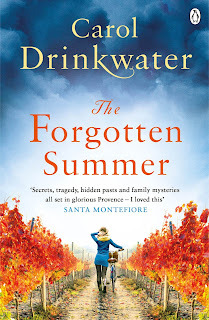 I love this time of year and what has been extra special for me this year is that THE FORGOTTEN SUMMER was published last week in paperback. To celebrate its publication, my husband and I visited one of our local Foire aux vins, a rendezvous for all lovers of good wine where a vast selection of French wines are on offer at slightly reduced prices. 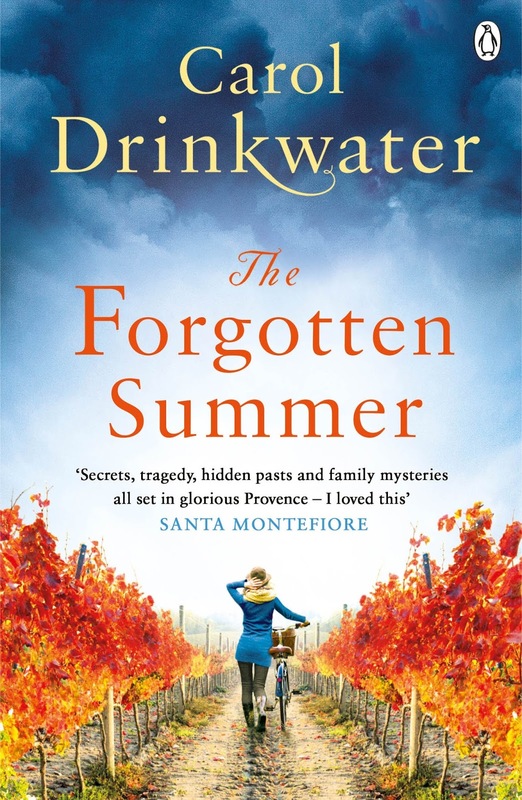 THE FORGOTTEN SUMMER is set, predominantly, on a family-owned vineyard in the south of France. The book opens with the harvest, la vendange. When I was a student, many of my colleagues would zip off to France or Italy about now and help with the grape-picking. The stories they returned with, along with their healthy sun-kissed cheeks, always made me a little wistful. I was one of those students who couldn’t really afford to travel, (which is possibly why I have been on the move ever since!) I had never visited a vineyard. I didn’t know anything of the back-breaking work, the heat in the fields, the sweet juice staining my fingers. All of these joyous experiences came to me later, and whilst writing on THE FORGOTTEN SUMMER I spent a great deal of time on several vineyards throughout all seasons to learn the entire wine-making process, but I particularly loved being out of doors in the fresh air at harvest-time. As well, I enjoyed the camaraderie that grows out of working with a small thrown-together team. It is all about picking by hand, just as we do with our olives. One of the main reasons for this is that discerning pickers will know to leave the poor fruits alone and not mix them in with top quality fruits. The moment of when to pick is an ancient art and getting it right is vital to the quality of the wine to come. Most winemakers decide their moment dependent on the sugar and acid levels in the fruit. Weather, too, is an important factor. This becomes clear in THE FORGOTTEN SUMMER when an unpredicted hail storm arrives from nowhere and beats down on the newly-picked grapes, destroying entire baskets of the estate's most cherished variety. The south of France with its abundance of rosé wines has been capturing the attention of wine connoisseurs the world over. Wine production here in the Midi has come of age, experts are claiming. It is true that until recently it has never been held with the regard given to Burgundy or Bordeaux productions but since Phoenician times it has been an active if not always top-notch business here. I read on Wikipedia that the oldest-known winery, -and judging by the remains excavated there it was a reasonably sophisticated affair - was found in Vayots Dzor, Armenia, and dates back to around 4100 BC. 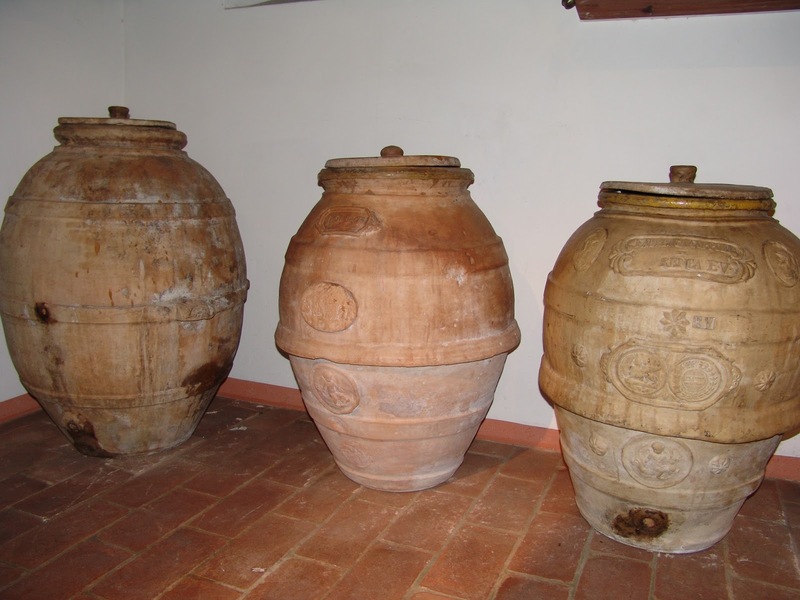 If this were the oldest winery it would date the industry at approximately 6,000 years old, which is at least 1,000 years younger than olive cultivation in the Middle East. 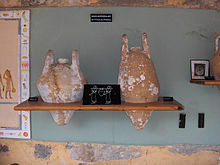 Georgia was producing wine during the same period as the Armenians and possibly earlier. They discovered wine-making when they buried wild grape juice underground in shallow pits throughout the winter. When the juice was dug up it had fermented. 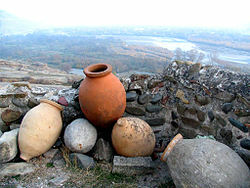 The next step was to sink grape juice in clay vessels with sealed wooden lids and leave these kvevris sometimes for up to fifty years. The kvevris resemble early amphorae which, from at least Phoenician times, were used to transport liquid produce such as wine or olive oil all around the Mediterranean. 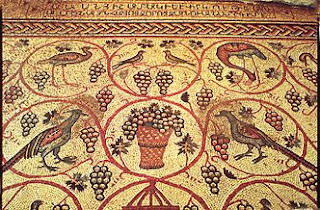 The Phoenicians played a vital role all along their maritime trading routes in disseminating both wine and olive knowledge. The search for the origins of viticulture is as complex a journey as my own Olive Route expeditions. It is possibly why the history of wine-making fascinates me as much as the olive culture. I can remember standing in the West Bank on a very sunny February morning planting olive saplings in groves where the old trees had been felled, and looking about me. Unrestricted views in every direction. Palestine. Ancient Palestine. Canaan, Phoenician fields. Israel. On each of these territories wine production has had an impact and that impact has been carried to ports all across the Mediterranean. Southern France, the original small port that was founded as Massilia, modern-day Marseille, would have seen the arrival of wine stock and olive trees somewhere around 600 BC. The Phoenicians first or possibly the Phocaean Greeks who came from the Asia Minor coast, from the port-city of Phocaea – today Foca in Turkey. Both peoples would have transported with them cultivation know-how as well as a floating nursery of sorts. 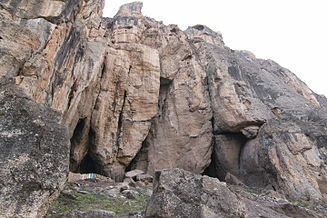 The resident Gauls were choosy about what they accepted from these long-distance foreigners, but they did welcome wine. After, came the Romans who planted up vast swathes of the Languedoc, the Mediterranean coast, Provence with vines. A couple of years ago I was invited to the Robert Mondavi Institute, University of California, Davis, to give a couple of lectures on my Olive Route experiences, embracing both the two travel books and the films. While there I came across a very excellent book, which I thoroughly recommend if the history of viticulture is of interest to you. It is a vast and intoxicating subject, and one I would love to travel to discover further. THE FORGOTTEN SUMMER, unlike THE OLIVE ROUTE and its sequel THE OLIVE TREE, is a novel. It is full of love, fine food and wines and intrigue. I hope that it is also imbued with my passion for southern France's agricultural past and the region's history. I leave you with Dionysus, or Bacchus. Such a handsome god in whose company I would enjoy driving a glass of wine. I’m so glad to have finally read some of the work of this extraordinary women. The daughter of the musicologist Dr Charles Burney, whose amanuensis she was, she daringly wrote an epistolary novel, Evelina, in her twenties. She published it anonymously, without her father’s knowledge, and when it became known that she was the author she became famous. Hester Thrale, David Garrick and Dr Johnson, (who infamously remarked that "Public practice of any art, and staring in men's faces, is very indelicate in a female"), were amongst her admirers. Like so many novels of the period, the plot hangs on illegitimacy, honour, chastity and now seems fairly conventional: Evelina’s virtue is rewarded as it turns out she is, after all, the legitimate daughter of a rich man and therefore deserves her Lord. At the time the novel was considered remarkable for its originality and wit. 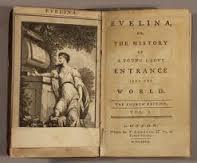 Evelina’s embarrassing grandmother, Madame Duval, is a satirical portrait of the stepmother Fanny and her sisters hated. 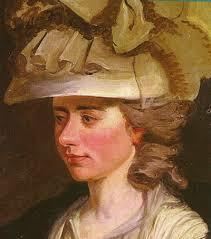 Jane Austen read Fanny Burney’s novels and was influenced by her. 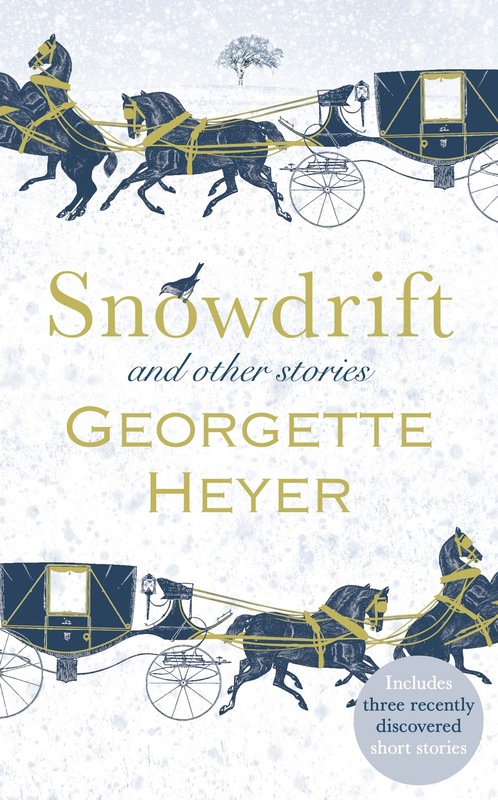 Near the end of Cecilia, her second novel: “The whole of this unfortunate business," said Dr Lyster, "has been the result of pride and prejudice.” She wrote more novels and also plays, one of which, The Woman Hater, was first performed in 2007 at the Orange Tree theatre in Richmond. During her lifetime her father and other friends constantly feared that her work would cause offence or make her appear unladylike. Queen Charlotte offered her the post of "Keeper of the Robes", with a salary of £200 per annum. Fanny hoped that the improved social status and income might allow her greater freedom to write but, although she became fond of the queen and princesses, her role at court was exhausting and tedious and left her little time to write. 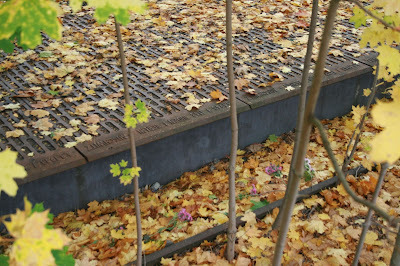 After five years she asked her father, who was then the organist at Chelsea Hospital, to help to release from the post. Fanny’s own later adventures were, I found, more gripping and moving than her novels and her own love story was far less conventional than her heroines’. Her journals, written in a lively style punctuated by those eighteenth century dashes that are like bolts of energy, are very readable. In her late thirties she married a French refugee, Monsieur, later General, Alexandre d’Arblay, a Catholic. He was considered so unsuitable that her father refused to attend the wedding. 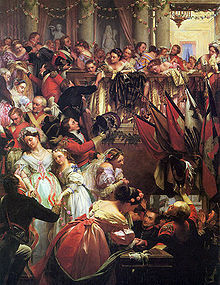 D'Arblay was offered service with Buonaparte’s government in France, and in 1802 Fanny and her son Alexander followed him to Paris. She refers to them, endearingly, as My Alexanders. They expected to be in France for a year but due to the outbreak of war between France and England they had to stay for ten years and she desperately missed her family. She wrote a terrifying account of her mastectomy in 1811. She was conscious throughout as there were of course no anaesthetics then: “I began a scream that lasted unintermittingly during the whole time of the incision – & I almost marvel that it rings not in my Ears still? so excruciating was the agony.” Being squeamish, I must admit I could hardly bear to read this. Despite this ordeal she lived until the then ripe old age of 87. For me, the most fascinating part of her journals is her account (some of it written many years after the events) of the atmosphere before and after the Battle of Waterloo. Thackeray drew on these pages when he wrote Vanity Fair. I was riveted by her description of her journey to join her wounded husband, who had been fighting to defend Louis XV111 and lay, dangerously ill, in Trèves (now Trier) in Germany. 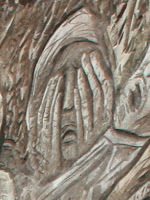 Fanny, in her sixties, left Brussels, without a new passport and almost without money, as soon as she heard that Alexandre was wounded. Her intrepid journey by stage coach took five days and at each town she had to show her French passport and get it signed by an official. I am currently deep into the research and writing of my next project TEMPLAR SILKS, the story of William Marshal's missing years during his journey, sojourn and return from the Holy Land between 1183 and early 1186. The Holy Land, known as Outremer to Medieval folk and translating as 'Lands Beyond the Sea' tended to refer to the countries that are now Israel, Syria, Lebanon, Jordan, with bits of Turkey and Egypt thrown in. My research is entailing detailed study of all aspects of life in the Holy Land, some of which will find its way into the novel and some which will inform my own background knowledge. I haven't as yet written a sugar production scene, but if I want to, I now have the basics to hand and should William see sugar in his travels, he will know what it looks like and the processes involved. In almost every book I have come across detailing the commerce, culture and agriculture of the lands under Christian control in the period between 1100-1187, there has been a reference to sugar. A rare and expensive commodity in Northern Europe its use in the Middle Ages was mostly medicinal. The medieval idea of good health was to have all one's humors in balance. Not too hot, not too cold, not too dry, not too wet. An imbalance of any of these things could bring on various states of malaise. Sugar as a substance on the table of humours was hot in the first degree and moist in the second. This made it a balanced and agreeable foodstuff, but it was also thought to have properties that enhanced other ingredients and was thus a frequent component in medicinal recipes. Sugar cane, of Asian origin, could not be grown in northern Europe because it required consistent warmth and the only country able to grow it in mainland Europe was southern Spain. 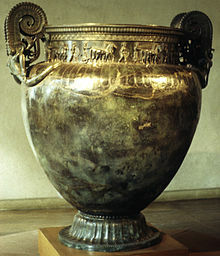 However, by the end of the Middle Ages it was being successfully grown in Cyprus and Sicily. It also required copious amounts of water, which might not immediately seem a match with the Middle East, but there were areas of good rainfall and clever use was made of irrigation channels and aqueducts to carry water to the plantations. In the mid 13th century sugar plantations near Tyre in modern Lebanon stretched for miles. 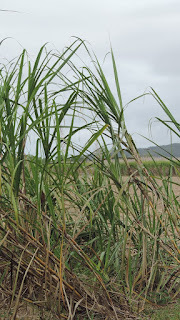 Centres of sugar cane growing also existed in Galilee. It was sometimes grown as a two year crop rotation, corn being grown on part of the fallow land on alternate years. (corn here, having the meaning from ancient times of wheat and associated grains, not corn on the cob which is a product of the Americas). 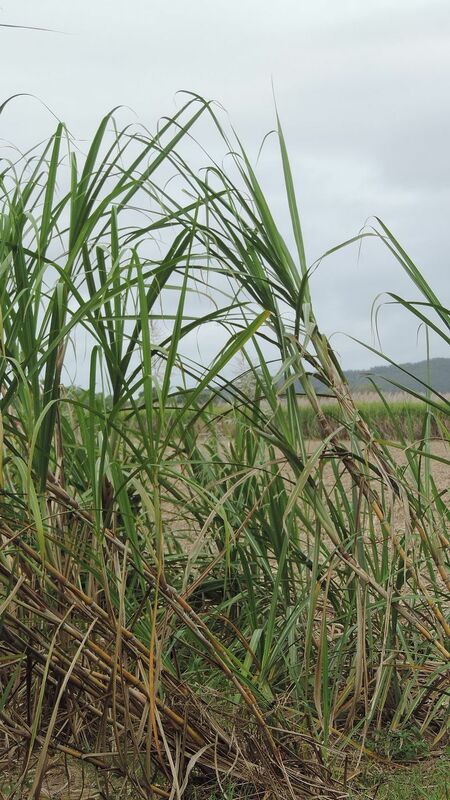 Some of the sugar cane was was cut into 6 inch lengths and sold raw as a treat to be chewed for its sweet juices, although most of the harvested cane ended up as sugar loaf and molasses. In the period I am writing about, the late 12th century, the main producers of sugar cane in the Middle East were the military orders the Knights Templar and the Knights Hospitallers as well as the Teutonic Knights, and they had a major role to play in the development and expansion of the medieval sugar industry. One of the reasons for the role of the Templars and Hospitallers in the development of sugar production was that they had the financial resources to take the industry forwared. They had the capital to construct the necessary equipment and infrastructure - the mills, the refineries, the aqueducts and irrigation systems. They had the money to buy the ceramic jars and moulds to separate the sugar into moulded crystal cones and liquid molasses. They also had the resources to employ a workforce to produce the sugar. The Knights Hospitallers had their major sugar plantations near Tiberias, fed by a complex irrigation system. Much of the sugar grown by the Hospitallers was used to provision their hospital in Jerusalem where they cared for sick pilgrims, often more than a thousand at a time. Sugar was vital in the production of lectuaries, syrups and other medicines. 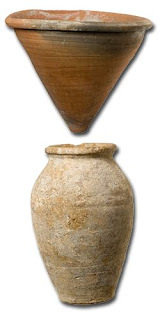 Excavations of the Templars quarter in Acre in 1997 uncovered hundreds of conical sugar moulds and molasses jars. The same for their refinery at Manueth, 14 km north-east of Acre where there was also a water driven mill and a sugar press. 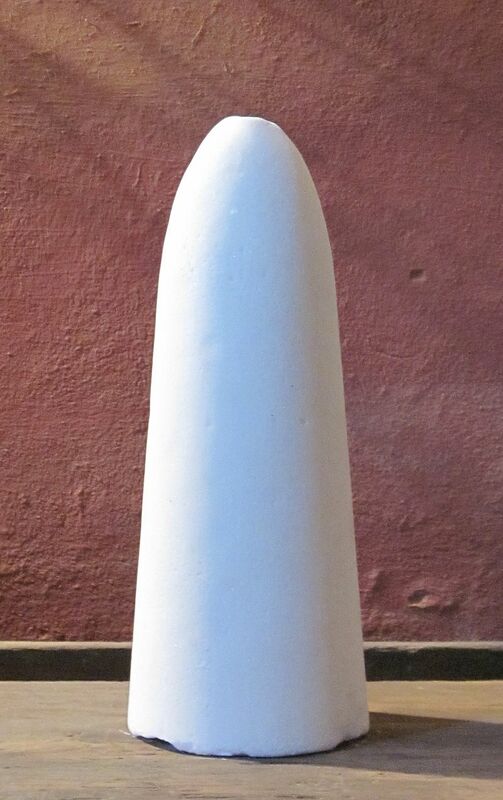 The sugar moulds were made from rough clay in the shape of a cone with a hole in the end. First the sugar cane was chopped, crushed then boiled in bronze vats. 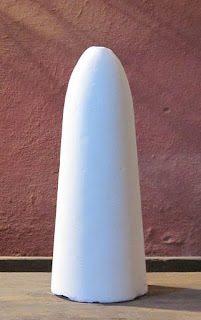 The resulting mixture was poured into moulds which were placed over ceramic jars. As the sugar syrup cooled and thickened, the liquid sugar dripped slowly into the jar as molasses, while crystallised sugar began to form in the mould. By the end of the process the mould was full of sugar and the jar full of molasses. At some point too, there was a clarifying process to clean the sugar. Sugar was produced this way for centuries as proven by the cone sugar one can see in many illustrations much later than the mediaeval period. Even today refined sugar is still produced by crushing and boiling the cane or beet and then refining to the end product. The technology has improved but it's still the same process. Elizabeth Chadwick is an award winning author of historical fiction. Her most recent work is a trilogy about Eleanor of Aquitaine. 'I know no one ever believes us nowadays – everyone thinks we knew everything. We knew nothing, it was all kept well secret.' Thus Brunhilde Pomsel, one of Goebbels's typists, recently quoted in The Guardian, talking about the Holocaust. And I found myself, as so often, thinking: 'Yes, you can say that, but how can I believe you?' It was the eternal question for people of my generation, fuelled, often, by our parents' and grandparents's total silence or the repeated 'We didn't know anything about it.' It felt like banging your head against a brick wall. 'You didn't know what it was like!' my mother told me, furiously. She was right, and I've spent years trying to find out, and to imaginatively reconstruct what it might have been like for her, who was eight when Hitler came to power. She was wrong, though, when she told me it was nothing to do with me and I shouldn't try and form my own opinions about it. 'What one generation can't deal with,' a rabbi once told me about the Holocaust, 'they pass on to the next generation who must then wrestle with it.' It has been a long but necessary journey for many, both Jews and Germans and people of part-German descent, like me. What my mother did once tell me was that she heard things, but she thought they were atrocity stories, such as were told about German soldiers during World War 1, and so people didn't believe them. I thought then that she was talking about the gas chambers. She's dead now, and so it's too late to ask her for clarification on this, but the Holocaust had two stages, and this is a crucial factor to bear in mind. These letters passed the censor, so clearly, at this stage, nobody minded allowing the information to leak out. 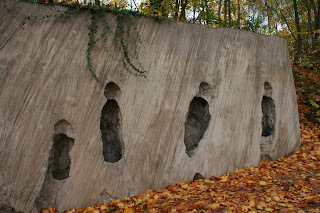 monument to deported Jews, Berlin Grunewald station. So it does seem inevitable that a fair proportion of Germans all over the country were aware of this phase of the Holocaust. Also Jews, including German Jews, were being murdered in the same way in Poland. Maybe this was what my mother meant when she spoke of 'atrocity stories'. How much, though, were these stories at the forefront of ordinary Germans' minds at the time? From early 1942 onwards (the time when 'deportations' of German Jews really got going), the British began to target civilians in German cities. The effects (which went far beyond the war years) on urban populations of trauma, lack of sleep, and loss of their homes, can be imagined. There would also be a feeling of powerlessness. Yes, your Jewish neighbours, your doctor, and so on, might well have disappeared, but what could anyone do about it? And this was largely true, with a few exceptions. Powerlessness brings apathy in its train. Many people must have got on with their lives, focussing on their own survival and that of their families. 'Why should I care about the Jews?' one woman said. 'I've got enough to worry about, with my husband and brother at the Front.' If this sounds unpalatable or shocking, I can remember, on the day of the Chernobyl accident, going to collect my kids from school, shaken by what had happened, to hear the other mothers talking about new washing machines, and similar concerns. Humans have a staggering ability to ignore the bigger picture, which is why some British children were allowed to play in radioactive rain that day. The second phase of the Holocaust was thought up following the secret Wannsee Conference, and in this context, it's worth considering a speech that Heinrich Himmler, head of the SS, made to SS leaders in October 1943. Anyway, the methods of mass murder were overhauled. Firstly, because in fact increasing numbers of perpetrators did suffer PTSD. Secondly, because the corpses didn't stay in the mass graves.I won't go into details about that, but suffice it to say that normal decomposition didn't take place. You can read about it elsewhere if you want to. It's horrible. And so the death camps were built, at Belzec, Sobibor, Treblinka, Birkenau, Majdankek,Chelmno; and new methods of murder dreamed up, along with huge ovens to get rid of the evidence. There was a lot of experimentation before prussic acid became the murder instrument of choice; putting people in vans and asphyxiating them with exhaust fumes was an early practice, which had already been tried out as part of the 'euthanasia' murders of disabled Germans. But from then on, the methods became more and more 'refined', and great efforts were made to keep the people unaware that they were about to be murdered. It's vital to remember that the death camps were not the same as the concentration camps in Germany/Austria, terrible though such places were. There is a gas chamber at Dachau, but it was never used. The concentration camps, in Germany, Buchenwald, Oranienburg, Ravensbrück, Dachau etc, incarcerated criminals, gay people, some political prisoners, and some Jews, who were worked to death, also prisoners of war, particularly from the East. I have read people who should have informed themselves better saying: 'Oh, but didn't they realise about the gassings when they saw the smoke coming out of the chimneys; the people who lived near the camps must have known.' Well, the locals did realise what was going on, we're talking about Poland here. Auschwitz was the only camp which was a labour camp as well as a factory of death (that was the satellite Birkenau, carefully hidden behind trees). I think the confusion arises because, as is well known, large amounts of Jews from Auschwitz, who were evacuated to the West, fetched up in these camps, Belsen being the horor everyone knows about. However, the horror of Belsen at the end of the war was different from the horrors of the extermination camps; except that its living skeletons and piles of corpses provided a potent image of the Nazi ideology of murder and death. 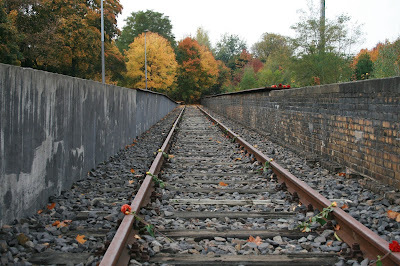 The rails at Grunewald station, from which so many Berlin Jews went to their deaths. 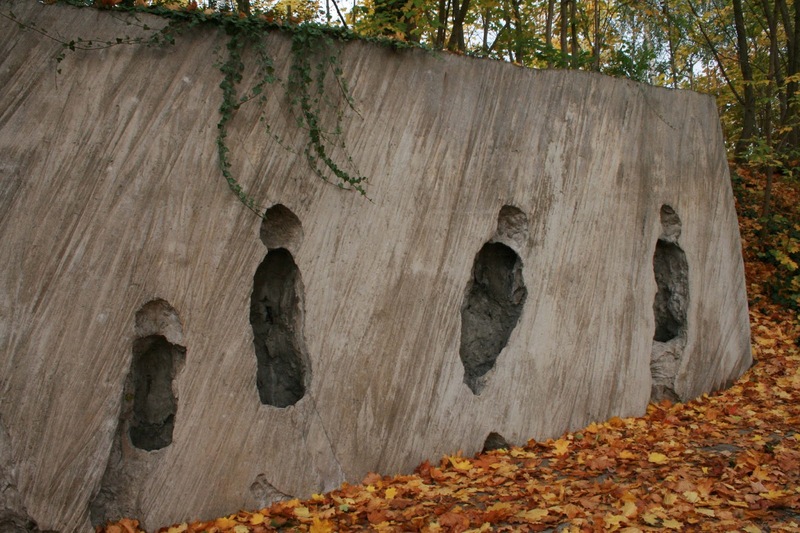 I do remember reading somewhere - but I've forgotten the reference- that Jews managed to escape from transports and returned to Berlin, to beg the Jews still there to go underground and not to let themselves be taken east - but the Berlin Jews refused to believe them. This was also the case when the Polish diplomat Jan Karski came to the Allies during the war, to alert them to what was going on in Poland and ask for their support. As Clare Mulley told readers of this blog in 'Jan Karski, messenger from the past,' nobody wanted to do anything, but most tellingly: 'Supreme Court Justice Felix Frankfurter, possibly the most influential Jewish man in the USA, simply said he could not believe Karski’s report. When asked if he was suggesting that Karski was lying, Frankfurter replied only that not being able to believe was not the same as doubting the reliability of the source.' In other words, what he was expected to believe was so abominable that he simply couldn't take it in. When I wrote both 'Saving Rafael' and 'Last Train from Kummersdorf', I made the knowledge of the mass shootings general, but the stories of the gas chambers something dreadful that my protagonists hoped wasn't true, and suffered when they discovered that it was. I think it's likely that many Germans, hearing, or hearing about, the BBC bulletins (and a phenomenal amount of Germans did listen to the BBC towards the end of the war, because it was the only reliable source of information about how things were going), simply blocked these stories out of their minds because they were too monstrous. And perhaps they forgot that they'd blocked them out. I was talking to a friend who grew up in Communist Czechoslovakia, and she told me that if you live in an atmosphere of lies, you become inclined to lie yourself (frequently as a matter of personal survival), and you end by believing the lies you tell. Memory is not a recording device, which you can play back at will. Memories decay, are corrupted in storage, and false memories can be easily implanted (like the man who, in a famous experiment, was told that he was once lost in a supermarket as a child, and ended up believing it and constructing his own story about it, though it never happened. And what does all this mean for us today? If we say 'Never again' about the Holocaust, we must consider what appalling things are going on nowadays, and be well aware of the blocking mechanisms that make us accept them. 'We need a strong economy' is one mantra deemed to be sufficient when we sell arms to regimes, such as the Saudi government, who are dropping British bombs on civilians and hospitals in Yemen. Every time I see an appeal for refugees, from reputable charities on Facebook, I see a rash of posts from people who say nobody should give money to refugees, even in camps thousands of miles away from Britain, because it is 'only encouraging them.' Such people have chosen to view all refugees as economic migrants, looking for a better life; it's easier, perhaps, than to face up to the enormous problem we're faced with, and the problems that the refugees themselves, more than anyone else, are faced with. And Trump, wanting to build a wall to keep Mexicans out of the US, never mentions that the skewed economic systems that exploit the developing world are precisely what makes their citizens want to come to the countries who profit from their own countries' resources. Then there is climate change, a growing and lethal threat to all of us, and yet most of us do 'get on with their lives.' 'I have to drive my car,' we say, or: 'I must have a new smart-phone.' Yet someone, or some part of our world, too often pays a terrible price for our impulse-purchase or bargain clothing, and one day we too will pay. The mechanisms of denial are a survival mechanism, as Eliot pointed out, but they have enormous destructive power as well. Yes, we must be able to give ourselves comfort zones, for the sake of our humanity. Yet what we need also is to regularly emerge from these, as we emerge from our homes, see what is going on in the world outside, and take what action we can. A very quick post from me today! I thought I'd share some of my favourite reading of the last few weeks and see what you are all enjoying at the moment. 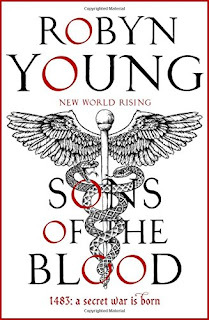 The start of a fantastic new series of historical adventures, Young's new book opens in 1483. 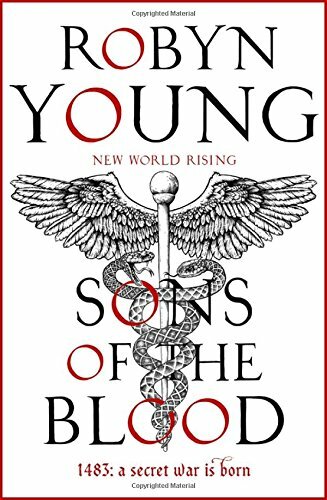 An illegitimate son who has been given a mysterious secret to guard wakes in Seville while his father is arrested in England by Richard of Gloucester. It's a rich and brilliant story, expertly told. I really enjoyed the portrait of Richard too, and the characters Jack Wynter meets on his travels are a series of vivid delights. I love Andrew's novels, so it was a real pleasure to read his latest. This is the start of a series too, I'm glad to say. 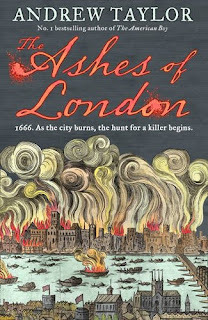 It opens in the midst of the flames of the Great Fire of 1666 as St Paul's burns. I think one of my favourite things about it was the portrait of London in the weeks following the fire, all smouldering ruins and debris being slowly cleared away. The mystery is deeply satisfying, as you'd expect, and the recreation of the feel of his characters' lives is masterful. This was first published in 1981, so I'm not bringing you one hot off the presses, but this slim, dense book is full of pleasures for lovers of history and language and the history of language. Some of my favourite headings within the book should give you a flavour. 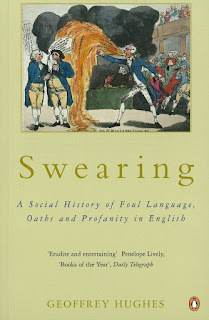 'The Rebirth of American Swearing', 'The Final Efflorescence of Flyting', 'Self-Binding Oaths: Boasts, Challenges and Vows'. Fascinating, and apparently Elizabeth I swore like a trooper. 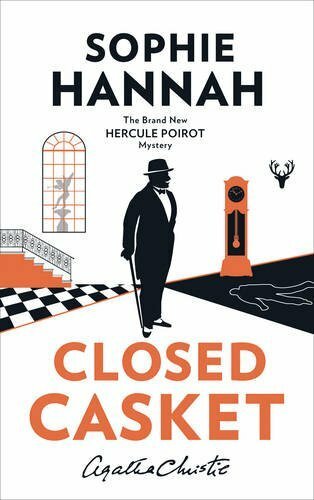 This is the new Hercule Poirot novel from Sophie Hannah. I have developed a growing respect for Agatha Christie over the last few years. 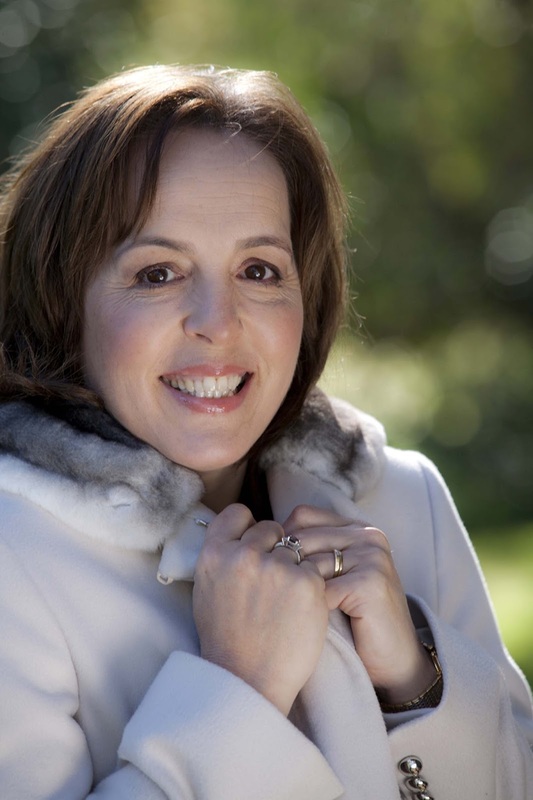 I'm afraid I saw a few bad TV adaptations and rather wrote her off in my youth, and I've discovered Christie was actually a rather wonderful writer only in the last couple of years. I never did warm to Hercule Poirot though, but now Closed Casket is bringing me over that hump too. Hannah has to take all the credit for that. It's a country house mystery set in the home of a famous author of detective stories, with all the pleasures of beautiful women, altered wills and uncomfortable revelations over the mutton soup. Hannah writes beautifully, capturing a certain voice and tone which is witty, but never forced and still allows all of her characters, including Poirot, to emerge as fully realised characters. There is a marvellous sense of time and place and I have developed a massive crush on her narrator, Inspector Edward Catchpool. I'm doing an event with Sophie, Lyn Shepherd and Jo Baker at the Harrogate History Festival in October. Do please come and see us. The village of Weobley is one of the most beautiful in England. However, lying as it does a mere four miles from the Welsh border, it has known troubles over the centuries, some arising from Marcher warfare, some due to wider national events. Today Weobley has retained a wealth of black-and-white medieval buildings, although some have been lost, and where the castle once stood on an eminence overlooking the village nothing is readily visible above ground but the castle mound and intriguing humps and bumps. Much of the valuable dressed stone from the castle building has found its way into village houses. Artifacts from the Mesolithic and Neolithic periods have been found in the area, including a Neolithic polished stone axe produced by the Graig Lwyd ‘axe factory’ at faraway Penmaenmawr (North Wales), an indication of long-distance trading contacts. Bronze Age cup-marked stones and small metal objects have also turned up, suggesting that this extremely fertile, sheltered and well-watered spot has been occupied since earliest times. Settlement seems to have increased during the Iron Age, Roman, and Romano-British periods, a number of coins having turned up, mostly in the abandoned castle site. If there is other evidence it probably lies under the medieval houses which stand in the long occupied central portion of the village, and so are inaccessible. 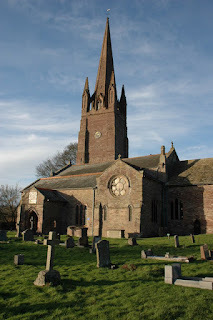 It is in the Saxon period that Weobley truly enters documented history. The name Weobley is of Saxon origin and is recorded in the Doomsday Book as Wibelai, which means ‘Wibba’s clearing’. Wibba may have been the son of Cribba, first king of Mercia (late 6th century). 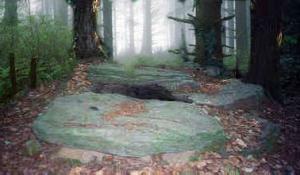 A ‘lai’ or ‘ley’ was a glade or clearing in woodland, used for a settlement. The Ley is a sixteenth century house on the outskirts of the village. The original form of the name as Wibelai perhaps accounts for the present-day pronunciation, which is ‘Webly’, the ‘o’ not being sounded. The pre-Conquest lord of Weobley at the time of the Doomsday Book (1086) is listed as Edwin. A priest is also recorded, so it seems there was already a church in the village. The Conqueror’s inventory of the lands he had seized indicate a flourishing agricultural settlement. As a side note – we own a house on the banks of the brook which runs through the village. It seems that this was regularly allowed to flood in winter, thereby depositing silt washed down from the limestone Burton and Wormesley hills to the south, resulting in what is still an extraordinarily rich soil. Weobley, with the surrounding area, was granted post-Conquest to William fitzOsborn, Earl of Hereford. (The city of Hereford is twelve miles to the south.) The family did not long remain in possession, for a rebellion by William’s son, Roger de Breteuil in 1074 was put down by Walter de Lacy, who then succeeded him as tenant-in-chief of the crown. He himself did not enjoy his lordship for long, as he fell to his death in 1085 from St Peter’s Church in Hereford while it was under construction. (Faulty medieval scaffolding?) His son Roger therefore held Weobley at the time of the Doomsday survey, and may have been the original builder of the castle. Weobley was to see more war and rebellion. During the Anarchy, the struggle between the Empress Matilda and her cousin Stephen for the crown of England, Weobley Castle was held for Matilda in 1139. Stephen besieged and captured it in 1140, an experience which must have had a serious effect on the villagers. By the late 1180s, the castle was held by Matilda’s son, Henry II. The de Lacy family continued to be prominent in the area, although for a time they were mainly concerned with their lands in Ireland. More trouble was brewing, however. The second Walter de Lacy married Margaret, daughter of William de Braose, lord of Brecon, who was one of the barons who rose against King John, using Weobley as his headquarters. 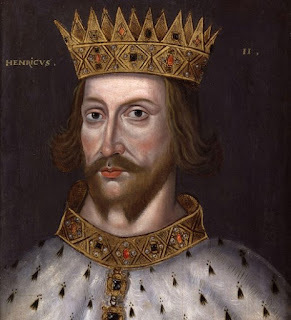 It was from Weobley that he may have launched his attack on Leominster, burning the town, and it was while he was in Weobley that King John demanded that he should surrender and hand over his son as hostage. As a result of his father-in-law’s activities, Walter de Lacy lost his lands and only regained them in 1213, at which time (wisely) he probably rebuilt and strengthened Weobley Castle. This de Lacy went on to have a distinguished career as Custodian of Hereford Castle, and Sheriff of Herefordshire. In this latter role he implemented the new royal policy (alas, short-lived) of protection of the Jews. While all this political strife was happening, the people of Weobley were getting on with their lives. By this time Weobley had become a flourishing market town, serving the neighbouring villages, as well as being the centre of a prosperous agricultural district. At some point it must have been granted a charter for an annual fair, since Walter de Lacy petitioned for a change to the date in 1231. The very wide central area of the village would have been eminently suitable for holding a fair, though the slope might have made the pitching of stalls something of a headache! It is likely that this same busy de Lacy may have laid out more properties in the village, to increase his income from rents. Weobley was on the rise. By 1255 Weobley had its own jury in the court of eyre, which would be presided over by the king’s justices – the mark of its increased status as a borough. Weobley would no longer need to send its cases for trial in Hereford. Even earlier, a case in 1229 cites Weobley as a borough. And from 1295 to 1303 Weobley sent two Members to Parliament. The powerful de Lacy family was to die out. When Walter died in 1241, his only heir was his granddaughter Margery, now married to John de Verdon, a family which has remained notable in the area down to modern times. 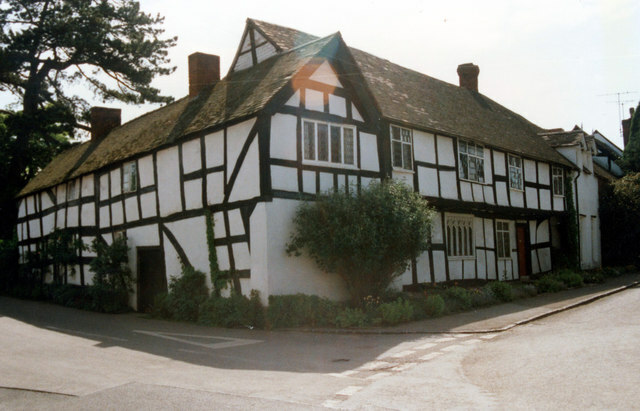 The lordship of Weobley passed to John, then to his son and grandson (both called Theobald).When the younger Theobald died in 1316, the heir was again a woman, his daughter, another Margery, thereafter known as the Lady of the Manor of Weobley. At the time of her inheritance, Margery Vernon was married to William le Blount, who was made joint heir in her father’s will. 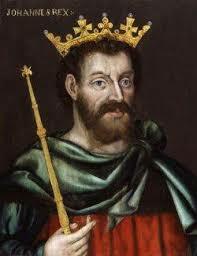 William died in 1337 and manor and castle passed to Margery and her heirs. As it was not normally the custom for a woman to hold a castle on her own, in 1338 she granted it for life to John le Blount, who may have been her brother-in-law. At some point Margery married a Marcus Husee, then in 1356 married for a third time, to John de Crophull or Crophill. If you do the sums, Margery was quite a remarkable lady. This third marriage was forty years after she had originally inherited from her father, when she was already married. How old was she? There is little information available about her second husband, but the Black Death occurred between 1348 and 1349, so he may have been a victim of it. Like everywhere else in Europe, Weobley is likely to have had a third to half its population wiped out. On his marriage to Margery, John de Crophull took possession of her property, and on his death in 1383 left it to his granddaughter Agnes. Considering the way the manor and castle of Weobley was passed around, it seems as though Margery had no children, or at any rate none who survived. It would have been impossible (given what must have been her age) for Agnes to have been her granddaughter. It is curious also how often the heir to the manor of Weobley was a girl. Agnes was under age when she married Sir Walter Devereux – it was not uncommon for a rich heiress to be married off as a child – but in 1386 Sir Walter was able to prove that she was ‘of majority’, so that he could claim ‘livery’ of her lands. As usual, the husbands of these women took control. Weobley therefore fell into the hands of the Devereux family (of whom more later). Sir Walter was killed on 22nd June 1402, fighting under the Marcher lord Roger Mortimer against Owain Glyndwr at the battle of Bryn Glas (not far from Weobley), during the reign of Henry IV – a battle mentioned by Shakespeare. 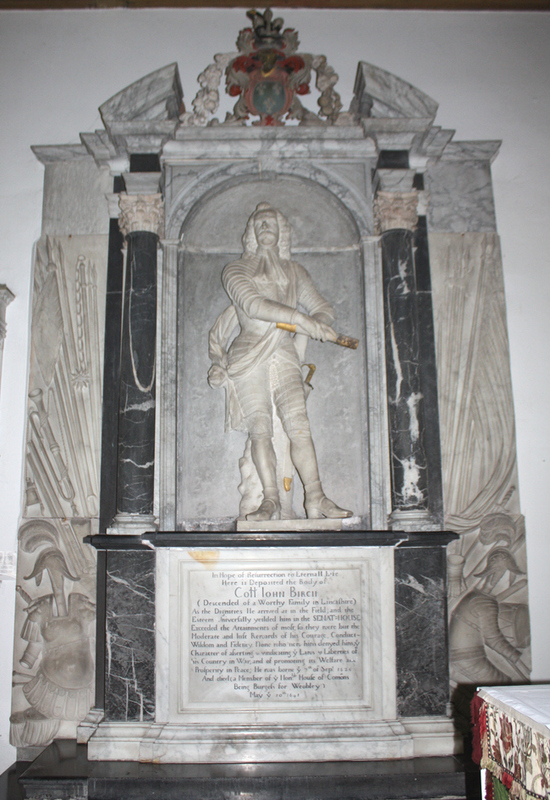 Sir Walter’s tomb is in the church of St Peter and St Paul, Weobley. Agnes, the Lady of the Manor of Weobley, then married Sir John Marbury (or Merbury) of nearby Lyonshall. He seems to have been living at Weobley Castle when he made his will in 1437. This mentions the ‘king’s chamber’, which suggests that there had been at least one royal visit to Weobley by this time. The tomb of Agnes and John Marbury is also in Weobley church. Much of the fifteenth century was, of course, blighted by the Wars of the Roses and Weobley was not exempt. Walter Devereux, grandson of the dead hero of Bryn Glas, fought on the losing side at the battle of Ludford Bridge. The enormous fines he was forced to pay were granted to the Duke of Buckingham in 1459. Ten years later, Weobley was to have another visitor, later to become a king. At the age of four, Henry Tudor had been taken captive by William Herbert, and later made his ward. 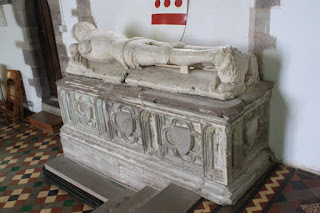 When Herbert died in 1469, his widow, Anne Devereux, took the twelve-year-old Henry home with her to Weobley, where he lived for several months. 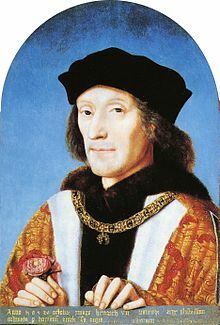 The final years of the fifteenth century saw further dramatic events when in 1483 Henry, Duke of Buckingham, attempted a rebellion against Richard III, using Weobley as his base. The rebellion was a failure, and although the Duke fled, disguised as a countryman, he was captured in Shropshire and taken for execution. His Duchess was seized in Weobley, but a Mistress Olliffe, governess to their two small boys, hid them in Weobley, then escaped with them, disguised as girls, to Hereford. 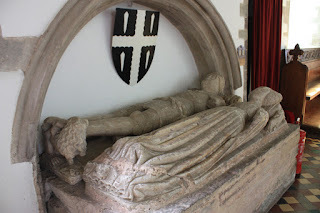 Six years later the son of the Walter Devereux who had fought at Ludford Bridge, rode off to Bosworth, and died there. So many of the events involving Weobley seem to have found their way into Shakespeare’s plays! While all these gentleman and knights were fighting and dying, the ordinary people of Weobley continued to build a prosperous town. It grew rich in the wool trade, and was famous for a number of manufactured articles, principally gloves, ale, and nails. One of its chief agricultural products was fruit, and the byproduct of its apple orchards, cider. During the sixteenth century Weobley saw few dramatic events – no doubt to the relief of the inhabitants – and the Devereux family continued to hold the manor. From being minor gentry, however, they rose under the Tudors, another Walter Devereux being created Earl of Essex by Elizabeth I, and his son, the second earl, rising to the giddy heights of royal favourite. This Robert Devereux – arrogant, wilful, and (dare one say?) stupid, decided to lead a coup against Elizabeth in 1601 which, not surprisingly, was an abject failure. He was executed for treason and his lands forfeit. His widow was Frances Walsingham, daughter of Elizabeth’s late spymaster Francis Walsingham. Their son Robert was ten at the time. Frances sought to have her son’s inheritance, including Weobley, restored, and in this was ably assisted by John Swinfen (d.1632), one of my husband’s ancestors. (So the family connection with Weobley goes back a long way. Interestingly John christened a son born in 1603 ‘Deveroxe’, a spelling which suggests how the name was pronounced at the time.) 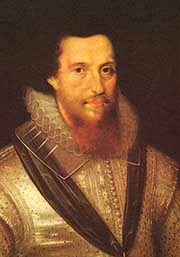 The appeal was successful and young Robert Devereux regained his lands in 1603. He was to become a general on the Parliamentary side in the Civil War and was yet another to have no male heirs, leaving Weobley to his eldest daughter, called Frances after his mother. There was another royal visit in 1645, when Charles I stayed at the Unicorn Inn after the battle of Naseby. The building was renamed The Throne in commemoration of the king’s visit, and is now a private house. The ‘new’ Unicorn was built across the road, also in the seventeenth century. The sixteenth century house looking across at the Throne is called Throne View, and was where my parents-in-law stayed when they first came to Weobley. 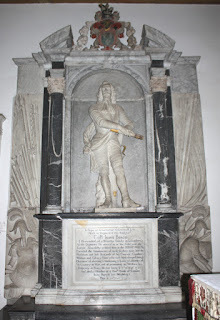 Weobley church contains a magnificent memorial to Colonel John Birch, a member of the Moderate Party in Parliament during the Civil War, and a friend of John Swynfen (1613-94), grandson of the other John. 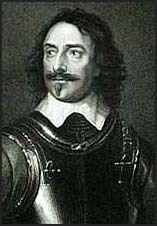 Both John Birch and John Swynfen fell out with Cromwell, being opposed to the execution of Charles I, as they supported the peaceful establishment of a constitutional monarchy with greater powers for Parliament. Cromwell had them excluded from Parliament. Birch retired to Weobley, where he purchased Garnstone Manor and became a prominent and highly regarded landowner, rebuilding the church spire in 1675, which had been destroyed in a storm 30 years before. He was MP for Weobley 1679-91. Weobley had resumed sending two Members to Parliament in 1628, and continued to do so down to the nineteenth century, by which time the once flourishing town had declined drastically in population, so that following the Reform Act of 1832 it was declared a ‘rotten borough’. After Weobley ceased to become politically useful, a number of apparently empty houses were demolished. However, recent research suggests that many of these may have been temporary buildings erected to house a ‘rent-a-crowd’ of voters, imported for elections only. The nineteenth century saw the erection of a rather fine brick-built workhouse on the northern outskirts of the village. Like other rural workhouses, this did not function in quite the same way as the urban workhouses described by Dickens. During the winter, they served as a refuge for casual farm labourers and their families when work on the surrounding farms dried up for the season. There are even records of entertainments laid on for the inmates, and the contracts for suppliers contain evidence of ample provision of food and clothing. In the mid nineteenth century it must have seemed a disaster when the widespread development of railways passed Weobley by. Without easy access to this new speedy form of transport, Weobley declined into gentle decay, but it was almost certainly this which saved all the wonderful medieval houses. There was a further disaster in 1943 when a group of houses (including a bakery) on a small triangular plot in the very centre of the village caught fire and burned down before the fire engines from Hereford could reach them. Looking at the tiny flower garden which has replaced them, it seems they must have been very small. With the expansion of car ownership since World War II, Weobley’s fortunes have changed again. Once more it outdoes all other villages in the area, with shops, schools, post office, pubs, restaurant, doctor, dentist, museum, library and all manner of social activities. 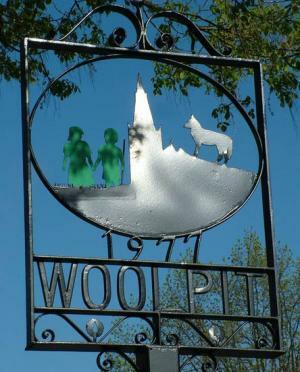 The de Lacy and Devereux families may be gone, along with the threat from Owain Glyndwr, but the people of Weobley have a flourishing community in one of the loveliest villages in England.